Home › Australian Solar Farms › Wandoan solar farm will add 1,000MW to QLD solar. Singaporean renewable energy company Equis Energy have advised they are planning on building a 1,000MW solar farm (which would be the largest solar farm in Australia) in Wandoan. The Wandoan solar farm will be situated right in the middle of Queensland’s coal and gas region – in Queensland’s area of the Surat Basin. This is exciting news for Queensland solar and Australian solar farms in general – it could potentially be one of the biggest solar farms in the world. The farm, which would add to the existing 4,000MW of renewable energy currently planned for QLD, will cover 1424 hectares and generate between 300 and 400 jobs during construction. According to the Toowoomba Chronicle, the $2 billion project will commence construction in the next 12 months and work will be staggered over a three year period. 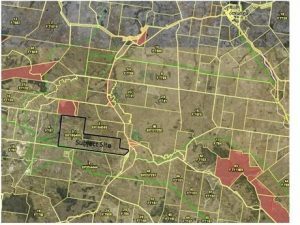 Paul McVeigh, the Western Downs Regional Council Mayor, was quoted in the Chronicle as saying the farm will represent a significant investment in the area – “It’s a $2 billion construction cost and of that we expect at least 50 per cent of that to be invested in the local community,” Cr McVeigh said. According to the Chinchilla News it is a $1.5 billion investment, but whichever price the farm ends up costing there’s no doubt it’ll be a massive boon to the community if it goes ahead. No word yet on the specifics of the site or if it’ll include any storage, but we’ll update this article as soon as we have any news about the farm.